Lady Hawks beat Daviess Co. 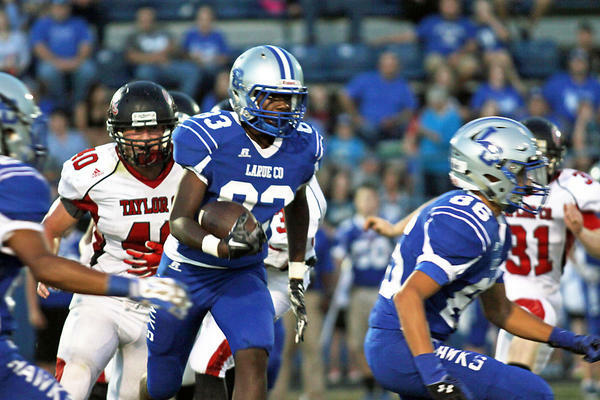 The LaRue County Hawks dropped to 1-4 on the season following a 27-0 loss to Taylor County Cardinals last Friday, September 18. 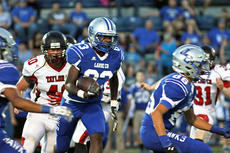 Kendrick Weathers evades a tackler during the Hawks 27-0 loss to Talor County last Friday. 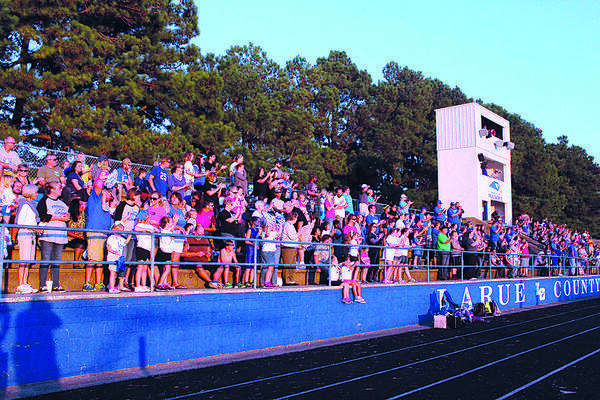 The stands were packed during the LaRue County Hawks football game last Friday night. The Hawks next game is this Friday, September 25 when they travel to Munfordville to take on the Hart County Raiders at 7 p.m. The Hawks were shutout by the Cardinals and they only gained 106 total yards with 60 rushing yards and 46 passing yards. Unlike the Hawks, the Cardinals had a great night offensively with 287 yards rushing and 74 yards passing. Hawks Head Coach Tony Hatmaker said it was a tough game for them as Taylor County controlled the tempo of the game. Hatmaker went on to say that Taylor County is a well coached team that executed their plan effectively during the game. He said one of the areas the Hawks need to work on the most is their red zone offense. During the game against Taylor County, the Hawks were led on offense by running back Cameron Pellegrino with three carries for 50 yards. Running back Marquis Franklin was the only other Hawk to pick up rushing yards with 12 carries for 41 yards. Quarterback Dane Milby was 7 out of 12 passing attempts for 46 yards with one interception. Milby was also sacked three times and had five total carries for -31 yards. Pellegrino also led the Hawks in receiving with one catch for 21 yards, Kane Harris was second with three catches for 13 yards, Bryson Cobb had one catch for 7 yards and Franklin got one catch for 3 yards. Aside from his outstanding offensive performance, Pellegrino led the Hawks on defense as well with 13 tackles with one tackle for a loss. 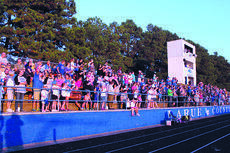 Other Hawks picking up tackles were Colby Skaggs with 8, Travis Wallace had 7 with one tackle for a loss, Harris and Demarcus McCray got 5 each, Jataivian Powell had 5 with one tackle for a loss, Franklin had 4, Ethan Johnson got 3 and Masyn Cobb, Victor Jimenez and Milby all had 2 each and Cobb had one tackle and one pass deflection. Matt Underwood, Chase Puyear, Anthony Adkins, Damon King and Luis Serrano were all credited with one tackle each. The Hawks next game is Friday, September 25 when they travel to Munfordville to take on the Hart County Raiders. Kick-off is at 7 p.m.
Hatmaker said the Raiders have gotten off to a good start and that they have a lot of confidence as a team.